This is the way I make BgInfo work in Windows 2012 (and even Windows 7 too). It is a little different than in the past but I still need my BgInfo info screen displayed so this is what I figured out. Follow the steps! You need BgInfo from here. I recently reused this article with BGInfo v4.21 and now with Windows 2016 too. You should create a c:\utils folder and make sure users have access to it for read and write. This is where things like BgInfo, Autoruns, and Process Explorer would be placed. It is also where you save your BGInfo config file after you have customized BGinfo. I created a file normal.bgi. Next, you will need to create a shortcut to Bginfo.exe. You will need to copy this shortcut to the c:\users\administrator\AppData\Roaming\Microsoft\Windows\Start Menu folder and place it into a new folder called Utilities. NOTE – if you are doing this as part of template prep you perhaps should use the user folder that you are working as and not administrator – unless of course if you are working as the administrator. BTW, you would do this for things like I mentioned above – Autoruns and Process Explorer. The target should have added to it the existing c:\utils\Bginfo.exe the following c:\utils\normal.bgi so edit the properties of the shortcut. See below. Create a copy of this shortcut. You will now need to copy it to the Startup folder. You can access the Startup folder at c:\users\administrator\AppData\Microsoft\Start Menu\Programs\Startup or by entering Shell:Startup in the explorer path window. As you can see below. Now you will need to edit the properties of the shortcut in the Startup folder. You should add /timer:0, to avoid the typical UI popup, /nolicprompt to make sure new users are not prompted to acknowledge the EULA, and /silent to silence any errors. Not all of these parameters will be seen in the screenshot below. Now we have BgInfo configured to be started from the Utilities folder on the Aero desktop, but also to be automatically executed at log in. But it is not configured for the display that you want. 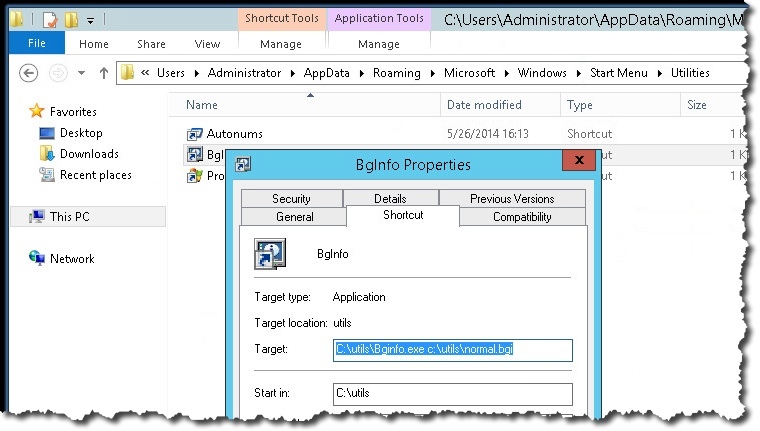 You should start BgInfo from the Utilities folder – as seen below in the Aero desktop and make sure to save your configuration to c:\utils\normal.bgi. Note: this screen above looks different in Win2K16 but it is close enough. The utilities folder was seen right away, but the utilities in it were not visable for a while and two restarts. They were functional if you went to their folder but their icon was not seen in the Utilities folder as seen in the screen above. The configuration of BgInfo when it is working is relatively simple and so I will let you deal with it. The config I like is seen below. Now you should test. 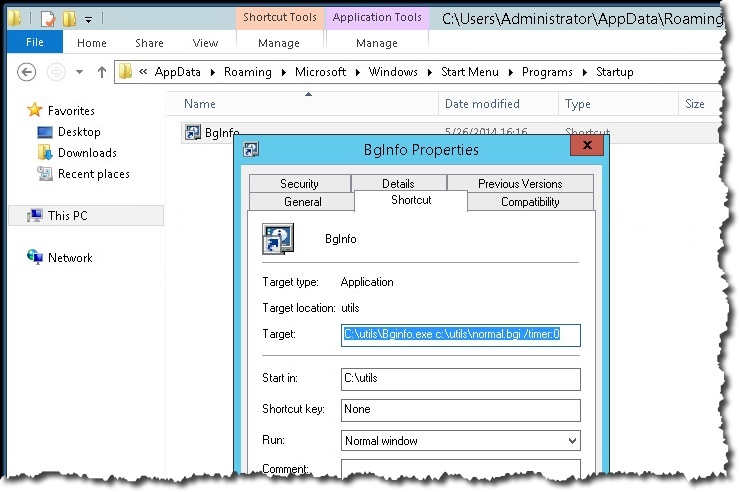 This will work for the administrator user, plus when you deploy this from template and use sysprep it will make sure that this config is part of the default user and so new users will get it too. I hope that this helps, and if you have questions or comments please do not hesitate to let me know. 3/17/19 – I added some additional info on normal.bgi. It is what is created after you edit in BGInfo and then save. It can have any name but I used normal. I have tested this outline with 4.21 of BGinfo and Windows 2016 and it worked – with the comments above. Next Post Postbox – new email starts here! And this is Win2k12r2 also. Hi Michael B, sounds like you have it. I would have used folder properties. And your run as admin command prompt and do the attrib should have worked. Try log out and log back in, and maybe check the ACL. Sorry no other ideas. I was admin all the way around, run as admin on the shortcut, new build on the server, not even on the domain yet. Anyway, I ended up running the .exe directly from the c:\utils directory and it wrote the normal.bgi file without issue. One of the lovely things about Microsoft that baffles us and keeps us employed. RE the normal.bgi, do we create the normal.bgi (by saving the BGinfo.big AS normal.bgi)? I also copy it to new machines to do things quicker. Thanks for posting this article on BGinfo. I have a question, the template you mention here is not accessible so I do not know what I am supposed to see here next, see the lines below. I will revisit this article soon and correct the issue with the template. I will also check the readability too. The second paragraph about what you suggest is confusing, is just that if you follow the article, and a new user logs in, they should see the BGInfo information. 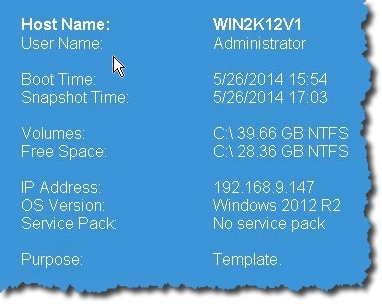 Any idea why my BGinfo is not firing up for all the users on a terminal service (win2012) server? I do not know what I am missing…. It looks like you found a typo for me. Very sorry you had to find it. It is normal.bgi. i don’t see a normal.bgi anywhere. Sorry about that. It is the file that you create when you edit BGinfo and save what you did. I just use the name normal but it can be anything. I will try and make this clear in the article. Any suggestions on deploying through a GPO? Good idea but sure on the details.